Have we been seeing a creative renaissance for our vintage rock and metal acts? OK, so Black Sabbath may have played its last ever tour, we have seen one devastating rock star death after another and a number of acts are no more. But, in spite of all that, have we been witnessing a real renaissance for some of our classic rock and metal bands in recent years? I would contend we have. After some difficult years in the late eighties and nineties for many of our much loved rock giants, one band after another have been releasing albums that stand up really well against their early classics. The aforementioned Black Sabbath released the brilliant 13 album in 2013, which in my view can happily sit alongside the first four Sabbath albums as a genuine bona fide classic. Uriah Heep’s Outsider released in 2014 can unashamedly sit alongside the David Byron-era material in terms of Heep’s unmistakable brand of melodic hard rock. Girlschool’s Guilty As Sin is every bit as good as their era-defining early albums, with lead track Come The Revolution a match for any of their well-known classic tunes. Saxon’s Battering Ram from 2015 and Judas Priest’s Redeemer Of Souls from 2014, each reviewed elsewhere here, both stand up well and offer everything you’d want to hear in a new album from either band. Even The Stones have got in on the act with their critically-acclaimed back-to-basics Lonesome & Blue album celebrating their R&B roots. My theory is that all of these bands have reached a stage in their musical careers where, unlike some often painful attempts a decade or two ago, they have more than proved themselves. They now no longer feel obliged to sound contemporary or try to keep up with modern trends but can simply concentrate on sounding like themselves and producing the kind of music and the kind of albums that brought them to the public’s attention in the first place. Of course, it doesn’t mean we shouldn’t be championing newer rock acts and none of the bands I’m talking about here are going to be around forever. However, I think we could still be seeing a few more classic releases yet from some of our favourite rock veterans over the next few years. So it’s another trip to London and another trip to the Shepherd’s Bush Empire for New Wave Of British Heavy Metal veterans Saxon, who are currently headlining a tour that also includes includes Fastway and Girlschool. Girlschool are first up and deliver a great opening set. Even those unfamiliar with pretty much anything the band have put out since the 80s would find lots to like here. I always thought Girlschool’s brand of heavy metal worked best for them when they channelled their inner glam-pop sensibilities (something they always acknowledged was a key influence) and delivered songs that were loud, hard and heavy but laden with unmissable hooks, catchy choruses and memorable riffs. And for much of the set that’s exactly what we get: old favourites like Demolition Boys, Hit and Run, Emergency and (Gun cover) the fantastic Race With The Devil. Fitting very much into that template, too, is new song Come The Revolution, from their latest album: 2015’s Guilty as Sin. Even thirty-odd years after Girlschool formed all-female rock bands are few and far between but well done the women of Girlschool for keeping the flag flying all these years and for doing it so brilliantly in 2016. A definite thumbs up from me. When Fastway was launched in 1983 a heavy rock supergroup was in the offing, featuring former members of Motörhead, UFO, and Humble Pie. Pete Way of UFO left before they even made their first album and, incredible a guitarist though ‘Fast’ Eddie Clarke undoubtedly is, the band never really stayed on my musical radar. But at least that allowed me to approach their set tonight with a completely open mind. And my verdict: probably among the most talented performers of all three bands this evening. Eddie Clarke is an awesome guitarist, in particular, and Toby Jepsom (lead singer since 2007) has a great voice and a charismatic stage presence. And all the musicians had a good musical vibe and worked well on stage together. But… and this is a big but … compared to the other two bands this evening with their fistfuls of songs that are always imprinted on your brain and you can sing in the shower, this lot simply don’t reach that bar. In spite of some superb musicianship and a great stage presence having a great set of songs is, for me, a crucial component in distinguishing a good rock band from a truly exceptional one. However, Eddie Clarke’s greatest moment of the night is yet to come. By the time Saxon come on at around 9pm every last square inch of floorspace in the Shepherds Bush Empire is completely rammed. I like being part of a sell-out audience in a packed venue but this bordered on being too close for comfort. Perhaps it’s a welcome sign that Saxon need to start booking bigger venues for their next tour. Now Saxon have had their ups and downs over the years. After the initial wave of early 80s success, they never managed to attain the dizzy stadium-filling heights of their contemporaries like Iron Maiden (though personally I think Saxon are by far the superior band). Saxon risked being derided as heavy metal has-beens and written off as a bit of a joke. A much publicised documentary in 2007 saw them at constant loggerheads with Harvey Goldsmith as he took up the challenge to help restore the band’s popularity. But whether the band took on board any of Goldsmith’s advice or not it inevitably lead them to reflect on their music and their career. There’s been a significant change around in fortunes since and their bloody-minded determination to carry on serving their old fans as well as looking to gain a next generation of new ones has seen them through. The album currently being toured Battering Ram stands up well against any of their early classics and it’s great to hear the album’s title track open the set. The album has been played and played on my stereo and so songs like The Devil’s Footprint and Queen of Hearts have become familiar old friends to me now and sit well in the set alongside earlier material. The last third of the set, however, is a non-stop run-through of those early Saxon classics: And The Bands Played On, Dallas 1PM, Wheels of Steel . It’s briefly broken for one of those ‘need-to-be-there’ moments when Eddie Clarke returns to the stage for a cover of his old band’s Ace of Spades as Saxon’s very special tribute to Lemmy Kilmister. Then it’s on with more timeless classics: 747 (Strangers in the Night), Denim and Leather and Princess of the Night. Saxon in 2016 deliver the old material as good as they ever did, produce truly stunning new material and perform with a confidence and authority as befits one of British rock’s truly great bands. Just book a bigger venue next time, Biff! Whatever the genre of music and however talented the musicians, without strong tunes and hummable melodies no band is going to make much of an impact on me. And that goes as much for my heavy metal as anything else. It’s one of the reasons that attracted me to Saxon in the first place, thirty-odd years ago. And while there’s not necessarily the next Wheels of Steel or 747 (Strangers in the Night) on this album, there are certainly some strong and memorable songs here. 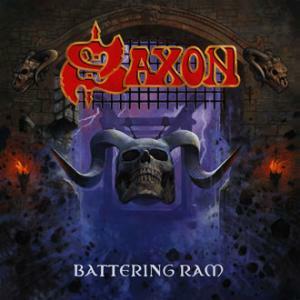 Title track Battering Ram is a classic slice of Saxon and a strong opener.. Biff Byford’s voice is as powerful as ever and the album rocks hard as you would expect. But there is light and shade here, too. Proggy, choral backing vocals on tracks like Queen of Hearts add texture and atmosphere to the hard, driving guitar riffs. Kingdon of the Cross, Byford’s poignant reflection on the slaughter of the First World War is another stand-out track on the album. “Comrades of their different coats, Came to fight and die, From all sides they stood and fought, And fell beneath the sky”. Apart from the choruses this track is delivered entirely in spoken word. That may sound strange for a Saxon track, but it works. In fact, Byford has such a wonderfully characterful speaking voice you could almost imagine him doing the voiceover for a BBC4 documentary. Any some-time fan of Saxon who feared this is a band who had lost their way years ago should get this album and have those fears immediately dispelled. And don’t just take my word for it. “This is cool. What’s this music?” asked a friend’s 15 year old daughter when her and her mum popped round just as I was playing the album for the first time. Biff would be pleased, I’m sure.